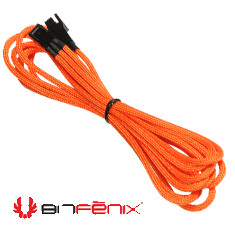 Bitfenix 3pin Fan Female to 3pin Fan Male extension cable 60cm. With input from some of the world's most prolific case modders, BitFenix Alchemy Multisleeved Cables offer a premium ultra-dense weave and a unique multisleeved construction for an unparalleled look. These premium cables feature precision molded connectors and high quality sleeving.